Are You Ready for a Second Dog? Four years ago, right around this time of year, I found myself getting ready for a second dog. As I started my training career, and after making great progress with Puffy, I found myself eager to train a dog from puppyhood. As I gained more knowledge and practice in dog training, I wanted to try everything I was learning on my very own dog. However, it took more than six years to take the plunge. Six years! Many people wondered why I was waiting so long to get another dog, especially since I had the skills to train one myself. Well, that was the problem: now, unlike when I got Puffy, I knew that raising a second dog would require a significant amount of time and effort. I knew I had to wait until I could provide a healthy upbringing for the second puppy. Make sure you are getting a second dog because YOU want another dog. Don’t get a second dog because you feel bad that your other dog is home alone for hours while you are at work. You feel guilty about not spending enough time playing and exercising your dog, and believe by getting a second dog he will have a buddy to play with all day. Consider the possibility that your dogs might not get along for a while, or they might not like playing with each other very much… or at all… ever. Or perhaps they do play, and because you are rarely around, the second dog becomes so bonded to the first dog that they become canine BFFs and you become the third wheel. 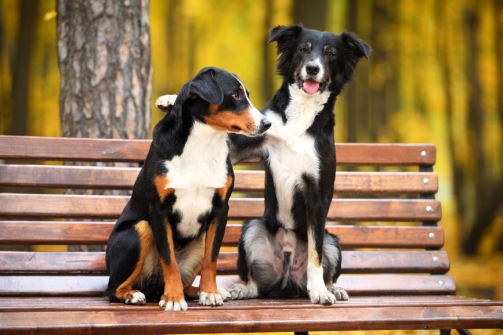 Whether your dogs don’t get along or they get along too well, it can cause problems in your relationship with your pets and your own stress levels. By the time I was finally ready to welcome my second dog, Puffy was 11 years old; he was a grumpy old man who hated puppies. He thought they were rude and ill-mannered, and he wanted nothing to do with them—or any other dog, for that matter. This was completely fine with me, because the puppy was for me, not him. His wishes for quiet and space were always well respected. Having a dog takes a great deal of commitment and time. Having two dogs can take twice the commitment and twice the time. Before thinking of adding another dog to your family, make sure your first dog has received a fair amount of training. Training allows you to develop a working relationship with your dog, while it teaches him the skills he needs to make life easier and less stressful for him and you. Having a way to communicate effectively with your dog will make working together less stressful, prevent problems, and diffuse tense situations. If your dog knows basic skills and is mentally healthy (no major anxiety or aggression), then you are ready to consider adding another four-legged member to the family. If you recently lost a dog and your second dog is having a difficult time coping, seek professional help for your dog rather than getting another dog to “solve” your dog’s anxiety. You want to build your dog’s confidence as the only dog in the house, rather than masking the problem. If you simply mask the anxiety or muddle it up by adding a new dog to the mix, the cycle of anxiety and insecurity can continue any time the new dog is not around. Of course, having a well-trained first dog also allows you to focus on training the second dog, and frees you from worrying about having two wild, untrained dogs running amok. By the time I brought home my new puppy, Lilu, I was happy with where Puffy was in his training. He had a good range of skills, had no separation anxiety, and could be easily managed. Having always wanted an Australian Shepherd, and living in the city, I was very aware that my hands would be full raising and training a miniature Aussie . Be Honest: Do You Have Time? It takes time and patience to help a new dog transition into our human world: to learn our rules, norms, and manners, and feel comfortable and confident in her new environment. This is especially true when you get a puppy, but older adopted dogs also need help transitioning from the shelter environment to your home, or from a foster home to their forever home. Change is stressful to anyone, including dogs, and they need our guidance in order to prevent separation anxiety, aggression or other anxiety-based problems. All dogs need to learn how to feel safe and confident on their own, even if they live with canine “siblings.” This might mean you need to walk each dog individually, and take them to separate training classes or activities (doubling the time required out of your daily and weekly schedule). With the huge age gap between Puffy (11 years old) and Lilu (8 weeks), I knew Lilu had to gain her own confidence and find her own personality as an individual—not as half of a pair. I often see the first dog influencing the second dog’s emotional state. If the first dog is barking, the second might start to bark as well. If one is anxious, the other will start worrying, too. Even the most balanced dog can start to change its emotional state if it’s constantly around an unbalanced dog. Sometimes the second dog will develop anxiety if the first dog isn’t around, which can take a serious toll on the second dog’s physical health. With Puffy already a senior dog, I knew Lilu had to learn how to be the only dog, because I knew at one point she was going to be the only dog. I was planning for the future and preparing for it in the present. You might be thinking this makes total sense—and I’m sure it does, right now, while you have a clear head. However, I want you to print this out and read this again when you are truly considering getting another dog. Ask yourself why you are getting another dog. As I mentioned, I waited more than six years to get Lilu. A couple of months ago, I lost Puffy, and it’s even tougher to wait for another dog now than it was years ago. Numerous times, I have had to remind myself that I am not ready for another dog—but the loss of a beloved four-legged best friend leaves you with an emptiness that you just want to fill again, as soon as possible. It makes you think you want another dog, but in reality it’s the emptiness you want to fill. As tough as it is, it’s important to myself and whatever dog comes to our family in the future that we all deal with the loss rather than try to Band-Aid the problem. Lilu and I are finding a new routine and creating new habits. We are coping with the transition in a healthy way. This way, when it’s time for another dog, I will be ready to spend the time and commitment I once did with Lilu. It will only be fair to the new dog—whoever he may be. 2018 Canina Dog Training. All Rights Reserved.